Hopefully we'll see Need for Speed succeed so Aaron Paul has a movie career. Hopefully Bryan Cranston either becomes Jim Gordon in the Batman reboot or Lex Luthor in Man of Steel II: World's Finest. 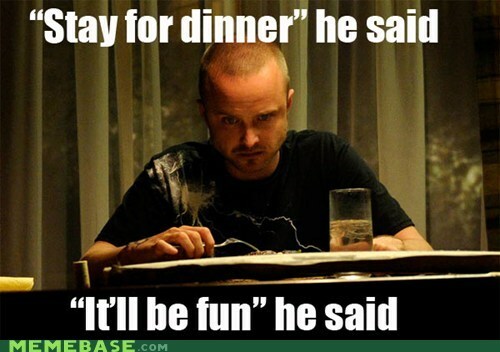 I don't watch Breaking Bad much, but the show and I are familiar with each other. This will be a short post, but a retrospective one with meaning. I remember the first episode I watched was halfway through the second season with Walter White doing what he does best, argue. I saw Aaron Paul's acting and was fascinated, wondering why he didn't do more roles. I watched the entire first season and the show was so different from anything Cranston had ever done. I haven't seen all the episodes, that way there will be more for me to watch after. Anyways, I've watched sporiadically from now and then. Maybe I will watch the finale, maybe not, but this is goodbye as it gets on this blog.